Heather Demetrios is the author of several critically acclaimed young adult novels and the editor of Dear Heartbreak: YA Authors and Teens on the Dark Side of Love. 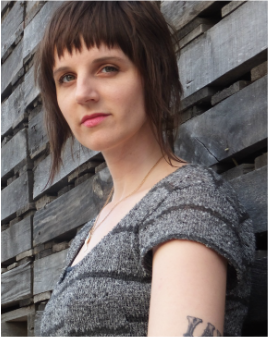 She has an MFA in Writing from Vermont College of Fine Arts and is a recipient of the PEN New England Susan P. Bloom Discovery Award for her debut novel, Something Real. Her other novels include I’ll Meet You There, Bad Romance, and the Dark Caravan trilogy (Exquisite Captive, Blood Passage, Freedom’s Slave). Her YA biography of WWII spy Virginia Hall, Codename Badass, is forthcoming. She is a certified meditation teacher, writing coach, and compulsive traveler. Find out more at www.heatherdemetrios.com. My eye caught a glint of metal; his prosthesis lay across the lounge chair. It was so strange, this limb, separate from a body, abandoned on the patio. Not human. Where there should have been blood and bones, there was only metal and plastic. Seeing the leg sitting by itself— that was the moment when I really understood what had happened to Josh. Here I was, treading water like it was nothing when for him it would be everything. I reached down and touched my leg. I ran my hand over my foot, past my ankle, along my shin, my calf, my knee, my thigh. Still there. I flexed my foot, turned my ankle round and round. It was a miracle, this leg. ​Josh’s metal calf ended at a plastic joint that acted as a knee—it was how he was able to bend the leg when he sat. Above the joint was a hollow plastic tube, like a soda bottle, but not transparent: dark blue and thick. I realized it made up for the part of his thigh that he’d lost. What did it feel like, to have that under your hand when you touched your leg? To scratch at an itch that couldn’t possibly be there? I approach my work with students holistically, so we take into account their process and lifestyle while also looking at their craft. It's all connected. I bring my experience as a meditation teacher into the fold as well, incorporating mindfulness techniques that help my students become more present, focused, and in flow as they bring their stories to life. We go deep into the art of writing and I make sure that, no matter what kind of class I teach, I pass on the craft essentials that help me with every book I write. My goal is that our time together leaves students jazzed to get to work, with lots of tools to help them navigate the ups and downs of the creative life and the confidence to write their hearts out.